If you got here from the Register Guard Story Click Here! March 16 ST6 CCD Image taken with Pine Mountain Observatory 32-inch telescope. Note the stars shining through the diffuse Coma. 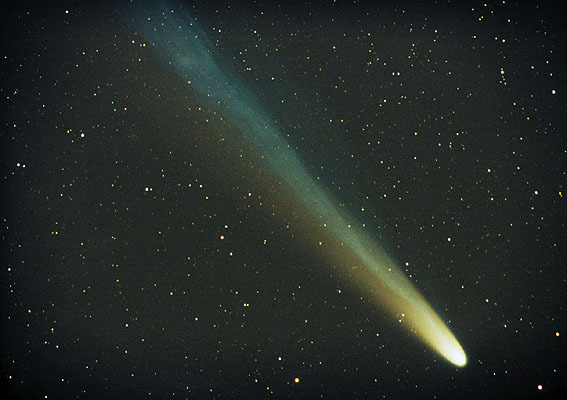 Comets are basically frozen balls of ice and dust of approximate diameter 10 km. As they get near the sun and are heated, the cometary material is vaporized and thus releasing the entrapped dust and gas. Often times there are rapid changes in the appearance of the comet nucleus and coma as streams of dust and gas come off the nucleus. This can result in an asymmetric appearance as shown in the this most recent image taken at the NTT at ESO . Gas streaming off the comet nucleus forms the ion tail of the comet which points directly away from the sun due to interaction with the solar wind. This can be seen here in this recent image taken at La Silla with the 1-m telescope. A cometary spectrum, shown below, generally reveals highly ionized emission lines of various C, CH and CN molecules which previously were stored in frozen form. Indeed, bombardment of the early earth by this material may have delivered many of the volatiles important to initiate chemical reactions in the early earth that synthesized amino acids. Hence, comets may really be your best friend and may have been the source of most of the earth's water. Vereinigung der Sternfreunde (VdS). In English and German. 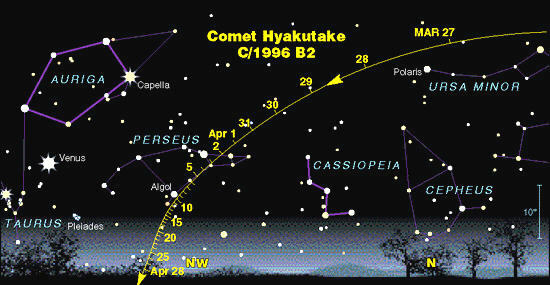 Sky & Telescope (with charts showing the comet's motion in the sky in March and April 1996). The manifestation of this high inclination is the rapid movement in the sky of the comet from south to North. On March 25 the comet will be at its point of closest approach. Although cometary brightnesses are notoriously difficult to accurately predict, this one is being well-studied and is evolving fairly rapidly. It is estimated to reach an integrated magntiude of +1 by March 25. This is as bright as the brightest appearing stars in the sky. However, the comet is not point like but is well-resolved and hence this brightness is spread out over some area. As such, the comet is best viewed from a dark location. The full extent of the Coma (the region of ionized gas around the nucleus) will likely be 1--2 degrees. The dust tail, illuminated via reflected sunlight, will be 15--25 degrees but rather diffuse. The path of the comet through the sky is shown here. On March 24 the comet will be relatively close to the bright red star Arcturus. It should not be difficult to see. The empheremis or positional data is shown here: Note the very rapid movement of the comet, almost 10 degrees per day. This makes telescopic observations really, really difficult! Date (UT)  Hr   R.A. J2000  Dec.